Queen Mokhuane is presently Acting Executive Director: Student Affairs and is also the Professor and Head in the department of Clinical Psychology at Medunsa Campus. She has an extensive experience in academia, students, teaching and student life including management. 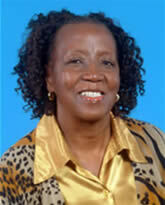 She has also received training in the auditing of institutions of higher learning. She holds a doctoral degree in Psychology (UNISA) and fellow ship in Public Health obtained from the University of Washington, Seattle, USA and an Internship in HIV/AIDS at the Seattle Community Mental Health. Queen has been extensively involved with international organizations such as the Kellogg’s Foundation and assisted in the development of academic and research projects for the training of health care personnel. She has been also involved in Mental Health Policy Initiative (Department of Health SA) Children’s Rights (Human Rights Division) – Geneva.